How do you decide which restaurants and street food vendors to eat from? How can you tell which food stalls are sanitary enough to eat at? Have you ever gotten sick from eating street food? How do you eat so much and not get fat? How do you get money for traveling? Don’t you have to work? How much does it cost to travel? How did you make your blog? What camera do you use? How do you decide which restaurants and street food vendors to eat from? Local Blogs and Forums – When you travel somewhere, try to find local food blogs and forums – even if they are in a different language, you can typically see some photos, and a map, and figure out where it is. Foursquare and Apps – Depending on what country you’re in, Foursquare can be a great app to start looking for food. Try to find reviews of places that are written in the local language so local people are recommending it rather than tourists. Walking Around – One of my personal favorites methods for finding great street food is just walking around. If you see a place that’s packed and looks good, go for it. This is how I’ve ended up at many of my most memorable meal experiences. Reaching Out – As my audience on YouTube and social media platforms has grown, I’ve started to reach out to local fans asking for food suggestions. I asked in Singapore, and was overwhelmed to receive hundreds of food recommendations. I know this may not always be possible, but if you have any locals to reach out to, they are definitely the most knowledgable. How can you tell which food stalls are sanitary enough to eat at? This is a tough question because everyone is a little different in terms of how our stomachs and bodies are created. 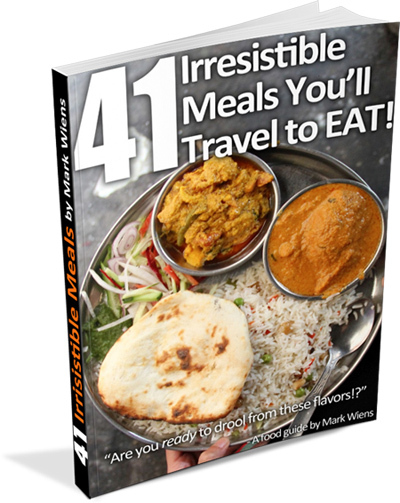 The first step of travel eating is to know yourself, your limitations, and what risk you’re willing to take. The truth of the matter is, I don’t usually know if any food stall or restaurant is sanitary. However, I’ve known people that get sick at their 5-star hotel buffet, but never get sick eating street food. Choose Busy Restaurants or Stalls – Street food stalls and restaurants that are busy with customers is one of the greatest signs that they serve fresh food. And also, they definitely don’t want their customers to get sick. Hot Food – Bacteria from food that sits out too long is a leading cause of food poisoning, so it can be wise to choose food that’s made to order, and served hot and fresh rather than room temperature. Use Your Instinct – If you feel the stall isn’t right or if you take a bite and realize something is a bit off, just stop eating immediately. Listen to yourself, and don’t risk it. Have you ever gotten sick from eating street food? Fortunately I’ve never really gotten seriously sick from eating street food or eating anything when I’ve been traveling. One of my main strategies is eating at street food stalls that are popular and busy, and have a constant turnover of food. How do you eat so much and not get fat? I think a combination of reasons – and I’m not a doctor or nutritionist, so don’t take any of this too seriously – but here are some reasons why I think I haven’t gained much weight. Desserts and Sweet Things – I personally don’t really care for desserts or sweets, and I also avoid any kind of sweet drinks. Walking and Exercising – When I travel, I love to walk and exercise as much as possible. Family Genes – Can’t say much about this, but I come from a family that eats quite a lot and doesn’t have too many problems with weight. Chilies – Chilies are one of my favorite foods, and there seems to be some evidence of chilies and weight loss. I’m no eating them for that purpose, but perhaps not a bad side effect. How do you get money for traveling? YouTube Video Ads – On my YouTube channel there are ads on my videos. T-shirts and eBooks – I sell t-shirts are eBooks on this website. Affiliate Recommendations – There are a few things that I recommend (from personal use or experience, like hotels or cameras I use), and if someone makes a purchase from my link, I’ll receive a small commission at no expense to the one who purchases. You can read more about how I make money here. Lastly, part of having money for traveling is about setting your goal and priority to travel. I choose to spend my money on travel and food as opposed to buying new clothes or a car. One of the great things about earning a living from projects on the internet, is that I can work from anywhere in the world as long as I have an internet connection. I work continuously, but my hours are never the same, and my schedule is always changing. Somedays I’ll sit on my computer for 12 hours straight, other days I’ll be out eating and filming, and creating content. But there’s always something to do, and although I enjoy doing what I do, I work a lot. The answer is, it’s really up to you, the way you choose to travel, your lifestyle, and the destinations you choose to visit. I’ve traveled in Sri Lanka for $11 per day, and I’ve traveled in Singapore for about $65 per day. Choose the destination you want to visit, and make it happen with the money you have – and if you want to stretch your money out to be able to travel longer, stop buying everything you don’t need and focus on your priority. How did you make your blog? I originally started Migrationology.com at the end of 2008. I had no idea what I was doing and I drank a lot of coffee, and finally figured out setup a blog with WordPress. Here’s a step by step guide that I wrote that will show you exactly how to start a blog. For my current blog now, my friend Henry, has completely coded and designed it. Currently, for all the photos and videos you see on Migrationology.com, I’m using a Lumix GX8. Read more about all the gear and setup I use on my resources page.